HAMILTON, Bermuda -- Heavy wind and rain began battering Bermuda late Wednesday as the British territory braced itself for Hurricane Nicole, which became a major Category 4 storm as it tracked toward the tiny island in the northern Atlantic Ocean. The U.S. National Hurricane Center in Miami said the storm is expected to pass near or over Bermuda on Thursday morning. Nicole was located about 210 miles (335 kilometers) south-southwest of Bermuda late Wednesday. It had maximum sustained winds of 130 mph (185 kph) and was moving north-northeast at 10 mph (17 kph). 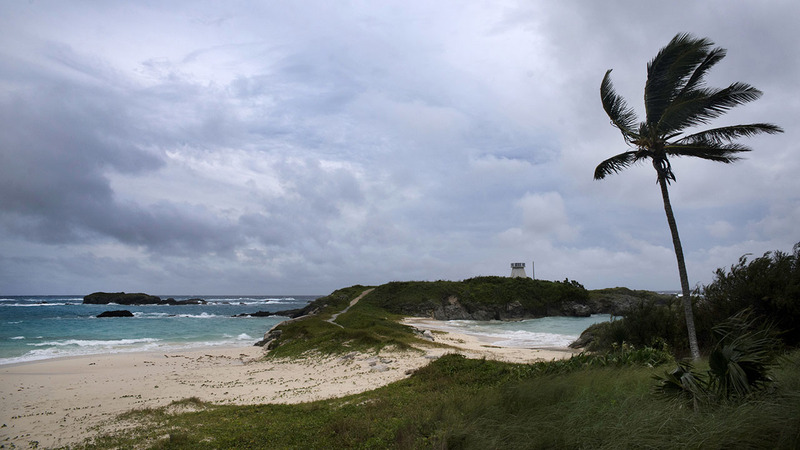 The storm could strengthen even more as it approaches Bermuda, forecasters said. While Bermuda has sturdy infrastructure and is accustomed to storms, government officials urged people to prepare for the hurricane and remain indoors on Wednesday and Thursday. "We have a long night in front of us," Premier Michael Dunkley said. "We better be prepared for the onslaught of hurricane force winds, but if we heed the warnings, we will be in a strong position once the storm blows through." Earlier on Wednesday, authorities closed schools and government offices as shops and gas stations reported brisk business ahead of the storm, with people buying batteries, matches, alcohol and ready-cooked meals. "Whatever happens, people are not going to go hungry," resident Byron Trott said as he pushed a bulging shopping cart toward the checkout counter. Bars in the capital of Hamilton remained busy, but most planned to close by late Wednesday night. Meanwhile, hotels reported an uptick in bookings as people sought shelters with power. Businesses were largely boarded up by Wednesday night, and dozens of vessels from one marina were already neatly packed away between historical buildings in Mangrove Bay, a popular spot for water activities in Bermuda's northwest tip. The hurricane is kicking up heavy surf in islands south of Bermuda including Puerto Rico, where authorities said they were looking for the body of a surfer who disappeared on Tuesday. He was identified as 37-year-old Gabriel Pantoja.